Cooked tomatoes sweeten this wonderful Chicken Cacciatore dinner. Try this delicious Italian Favorite. 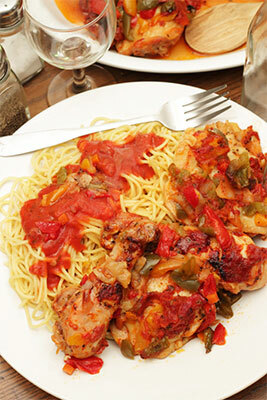 Why not serve Chicken Cacciatore tonight? Right from your own pressure cooker! I’ve been told that this is one of the best Chicken Cacciatore recipes there is. In a medium sized bowl, mix the Flour, 1st teaspoon Salt, and Pepper. In a large fry pan, heat the Olive Oil over the stove with medium-high heat. While pan is warming, coat each piece of chicken in the spiced Flour and set into the hot fry pan. Sauté for about 5-minutes on both sides until chicken is browned. Perfect Chicken Cacciatore from your Pressure Cooker. Combine Chicken Stock, White Wine, Mixed Vegetables, Diced Tomatoes, 2nd teaspoon Salt, Basil, Oregano, and Capers into the cook Pot. Place the Sautéed chicken pieces on top of the liquid. Place lid on the cooker and lock into place. Then set Pressure Button on the Control Panel to “HIGH”. Set desired cooking time by pressing “HIGH” button once for each minute or hold down continuously until desired time is reached Set to 12 minutes. Press START/STOP button to begin cooking. Indicator light will stop flashing. Cooker will begin to count down (in minutes) and Floating Valve will rise after appropriate cooking pressure has been reached. When time control reaches zero, cooker will beep 3 times and switch to the WARM setting automatically. Press START/STOP button to make sure unit is completely off. Turn Pressure Regulator Knob to “STEAM” or “VENT” (see note below) in short bursts to allow pressure to release. Unplug and remove lid. Transfer Chicken and Sauce to a large serving dish and garnish with Fresh Basil, if desired. This goes great with cooked egg noodles, spaghetti, or rice, and garlic bread or a tossed salad. 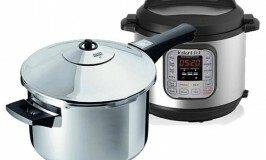 See the best-rated and Pressure Cooker Best Sellers available at Amazon.